Ireland got jobbed. Let's just say that right up front. Thierry Henry's handball assist to William Gallas for the goal that sent France to South Africa and the World Cup finals was illegitimate and a total travesty. Nobody who knows the first thing about football would dispute that. FIFA (or UEFA), if it had any sense of fairness, would order a replay of the match at a neutral site (or even in Paris again...) and give both teams a shot at redeeming themselves. Of course, that won't happen. And that's a shame. But the whole episode, while still fairly fresh, has led to some interesting discussions. Already, the inevitable comparisons to Diego Maradona and his notorious "hand of god" goal against the English in the 1986 World Cup finals are floating around out there. And already, a few backlash pundits are kind of sort of defending Henry, asking what any of us would have done in his place. Henry did, after all, admit after the match that he handled the ball, adding, somewhat brusquely, that he's "not the referee." Neither, apparently, is the Swedish ref who was in charge of the game--or, at least, the Swede's not much of a ref, nor are the linesmen who should have assisted him with the handball call. This wasn't a subtle case of handling, after all. This was slap-and-tickle, not a caress. But the Henry-Maradona comparison is interesting. Maradona was quite possibly (and for my money, was--sorry, Pele) the greatest player of all time. He was also massively arrogant and a bit of a scoundrel (allegedly)--he was rumored to have run drugs in Naples during his time with the local club, Napoli, and many observers, insiders, journalists and the like have linked him with a notorious Naples mafia family. So, really, the "hand of god" was par for the course for Diego, not an aberration. Or so it would seem. Thierry Henry, while brilliant, was likely never the best player in the world at any time and won't go into history as one of the two or three best ever. (Top ten? Maybe...but he's not in the Maradona-Pele class.) He does, however, have a reputation for being a classy player, for lack of a better word, and he certainly doesn't carry the image of a mafia associate or drug dealer. Quite the contrary--from most of what I've read and heard about Henry, he has a good-guy reputation and serves as a pretty legitimate hero to French kids, especially minority kids who often struggle to fit in with French culture. Great athletes, I really believe, play on instinct. Yes, they make decisions, but they make them quickly--so quickly, in fact, that those decisions are really more instinctual than they are rational. They're the result of years and years of training, repetition and constant improvement. 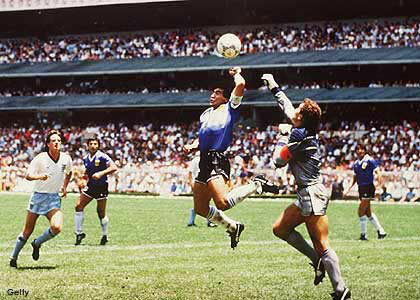 It's highly unlikely that Diego Maradona calculated slamming the ball into the net with his hand just before he did it. In all likelihood, instinct took over, the hand went up and...well, any Englishman knows the rest of the story. Likewise, despite the blatant nature of his handling violation, I doubt that Henry said to himself, "I'm going to knock this ball down with my hand and then pass it to Gallas" (in French, of course). He just did what his instinct told him to do--and, in this case, his instinctual move was illegal. Of course, not all athletes' instincts lead them to break rules. The great Paolo Di Canio, a West Ham legend and one of my favorite players of all time (strictly as a player, that is), famously caught a ball in a Premier League game versus Everton after the Everton goalkeeper suffered an injury and ended up in a heap on the pitch. Di Canio could have scored into an open net, and the goal would have counted--but he didn't. His instinct led him to do the sportsmanlike thing and stop play--not just because a player was injured but because (I like to think) a goal into an empty net in that situation would have reflected poorly on him and on his team no matter how important it might have been. In that moment of snap decision-making, Di Canio got it right, probably without even thinking about what he was doing. And while I'll freely admit that a random Premier League match carries not even a fraction of the weight of a World Cup game of any kind, instinct is instinct, and great athletes rarely let up or react differently based on the competition they're in. Would Di Canio have caught that ball playing for Italy in the World Cup? Maybe not--but I like to think that he would have, without really even thinking about it. Nevertheless, it's harsh, perhaps, to call either Henry or Maradona a "cheat," at least based on the two incidents in question. Cheats use more premeditated methods for gaining an unfair advantage--like a pitcher in baseball carrying a piece of sandpaper to the mound and using it to scuff balls and affect the trajectory of his pitches. Henry and Maradona just acted on instinct--poorly, unfortunately. And the referees and linesmen who allowed both goals are frankly the primary culprits in both affairs. However, that doesn't excuse Henry or Maradona. They're still guilty of breaking the rules--and of not admitting it on the pitch. Either player, realizing what had just happened in his respective situation, could have admitted to unfair play right there during the match. Would their goals have counted? Possibly not--I really don't know, honestly, but my guess is that a referee could have disallowed either one or both of them upon hearing the guilty player's confession. But both Henry and Maradona let their goals stand--quite proudly in Maradona's case. And therein lies their guilt and their shame. The "hand of god" and the illegal Henry assist will forever stain the legacies of Maradona and Henry (not that Maradona probably cares, but Henry very well might)--just as they'll forever taint Argentina's otherwise brilliant World Cup win and France's qualification for South Africa 2010. And the incidents will linger not so much because of what the players did in the heat of competition but because of what they didn't do--the bravery they didn't show with the world watching--in the immediate aftermath of their handballs. I'm not sure whether character has ever really mattered in sports. It's entirely possible--probable, I think--that yesterday's athletes cheated more often and more blatantly than do today's. (If only steroids had existed prior to the '70s or so...) And character in sports is a funny thing. Paolo Di Canio, the hero of this story, was a moody player at best and often took games off completely. He was tempestuous and, while sometimes brilliant, could be frustrating to both fans and teammates. Plus, I've read many accounts in which he has called himself a fascist--and, although he insists that he's not a racist, fascism isn't exactly one of history's more admirable political models (to say the very, very least). So, it's not always accurate to judge an athlete's personal character by his actions on the field of play. But it's fair to criticize athletes who don't own up to doing the wrong thing and don't at least try to put the situation right. And that's the saddest part about the Henry affair (for anybody who's not Irish). Ireland loses, obviously. The officials lose for being incompetent. FIFA and UEFA will likely lose for not encouraging fair play and ordering the match replayed. And even France and Thierry Henry lose--their reputations, their legitimacy and the respect of millions of fans. France wins, but, really, nobody wins. And football definitely loses. So, after all this moralizing, what would I have done in Thierry Henry's place? To be perfectly honest, I probably would have let the goal stand. The pressure to please an entire nation would have been too great. But I would have felt guilty and remorseful about it for the rest of my life. Would it have been worth it? Thierry Henry might just be about to find out.